If you’re in need of an organized desk space, these five steps will help get you there. It’s time to stop drowning in unnecessary papers and other random items and create a space that works for you and not against you. Let’s do this. Every morning I have the same routine: coffee, sit down at my desk to sip said coffee and work for 30 minutes, make lunches, take a shower and start my workday. Since my desk space is the second thing I see in the morning, it’s important to keep it as organized as possible. 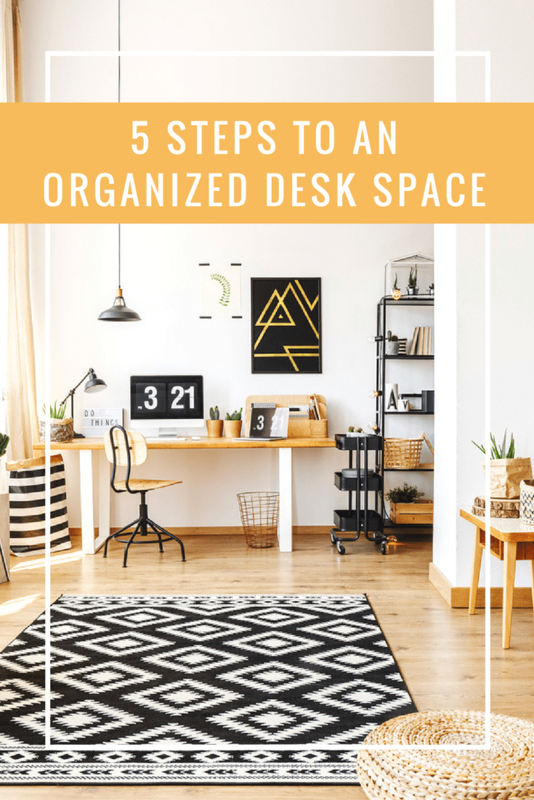 Here are some tips, tricks, and product recommendations for an organized desk space. Getting your desk space organized will be easier when you’re starting with a clean slate. Clear everything from the desk surface and from the drawers. Set everything on the floor or table. If your desk is very cluttered, most likely the surface hasn’t been cleaned in quite some time. Clean your desk inside and out with a multi-surface cleaner. This will start you off on the right foot! Now that everything is off the desk and out of the drawers, it’s time to sort through it all. Separate the items into three piles: throw away, keep and relocate. Items that are broken need to be thrown away. Holding onto them is just adding to the clutter. Be thorough, be stern and even enlist help from a friend, family member or colleague if you need to. It does matter how and where things on your desk are placed. You will want to position everything in a way that maximizes productivity. 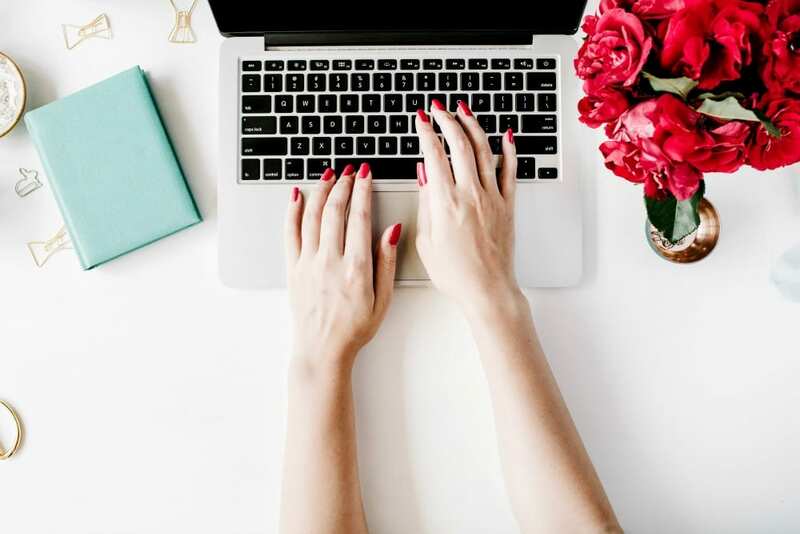 By keeping your most used items within arm’s length and where you can easily find them, you’ll save up to an hour a day looking for things and moving things around on your desk. Since you’re saving the top of your desk for important, daily items; use the drawers for items that are still needed but not as frequently. As you’re going throughout your work day, make a mental (or written down) note of what items are used the most and what items are not. Think of your drawers in an order of importance. Most used items go in the first drawer and so on. If like myself, your desk has no drawers then you have to utilize the top of your desk as best as possible. 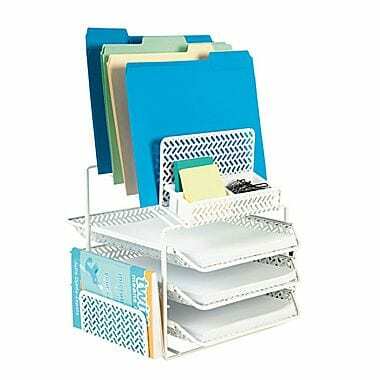 My desk is quite large, so I use this All-In-One tiered desk organizer from Staples. It holds a lot of my everyday office essentials and also has a place to store papers (both vertically and horizontally), a slot for mail and a cup of pens and pencils. So far it’s the most efficient desktop organizer I’ve found and it works perfectly for my needs. Other items, like extra office supplies, I store in decorative storage boxes like these on a bookshelf by my desk. I like that you can label them so you immediately know what’s inside. I also have two magazine holders since I frequently reach for a magazine when I need some inspiration. The bookshelf is on my right side (my dominant side) and it’s easy to grab what I need without having to get up and disturb my workflow. 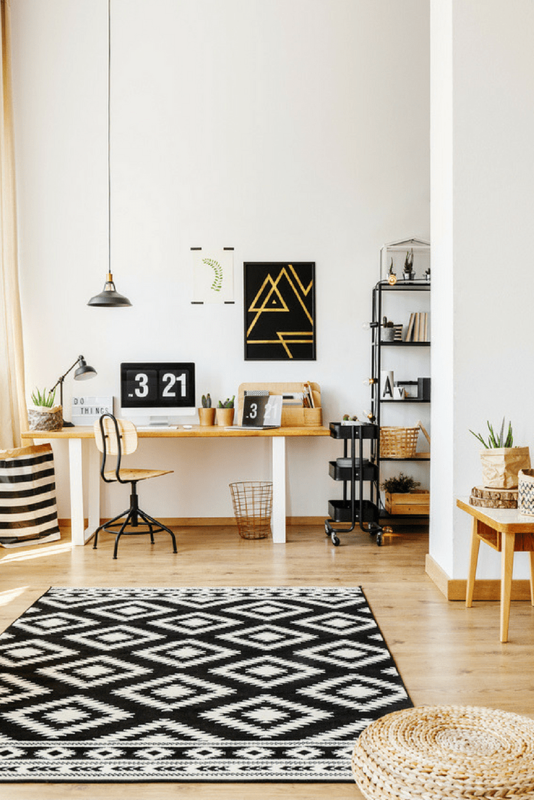 Now that you have an organized desk space, in order to keep it that way you have to be diligent at putting things back after you’ve used them. Spend a few minutes at the end of your workday cleaning up your desk. Put items away, wipe down your computer and desktop, throw away any trash, shred papers or unwanted junk mail (I have this shredder and it’s a perfect size, plus incredibly powerful) and get your desk ready for a new day. Walking into your office every morning to a clean desk will do wonders for your attitude and mental clarity. Do you have any organizing tips for keeping your desktop organized? What are some of your favorite products and go-to items? How did you know my desk needs to be decluttered and organized. Will be following your steps. I’m the same way Joanna. I love to throw stuff away! Yes, please! I want a clean desk but so often don’t take the necessary time to get organized. Thank you for these 3 simple steps…I’m getting started! So inspiring and I know it will cause me to be more productive! Such great suggestions! I especially love that you suggest starting with a clean slate — so helpful! Love that all-in-one desk organizer, too! Likely need to pick that up! Great suggestions! I need to work on not letting the clutter build up! Yes! I love keeping my space clean. Not sure there is anything better than an organized desk space. It’s so important to me! Love this post. Absolutely! I have got to get my home office desk under control. It’s just one of those things i don’t really think about until I am sitting down to work from home, which is NOT the time to start organizing the space. One step that I have taken is that I have just ordered a few set of this adjustable drawer divider that my friends have been talking about. Super excited to see how it will jump start my organizing!